Traveling the world has always been a goal of mine, but so far I haven’t made it much beyond Canada and a handful of U.S. states. 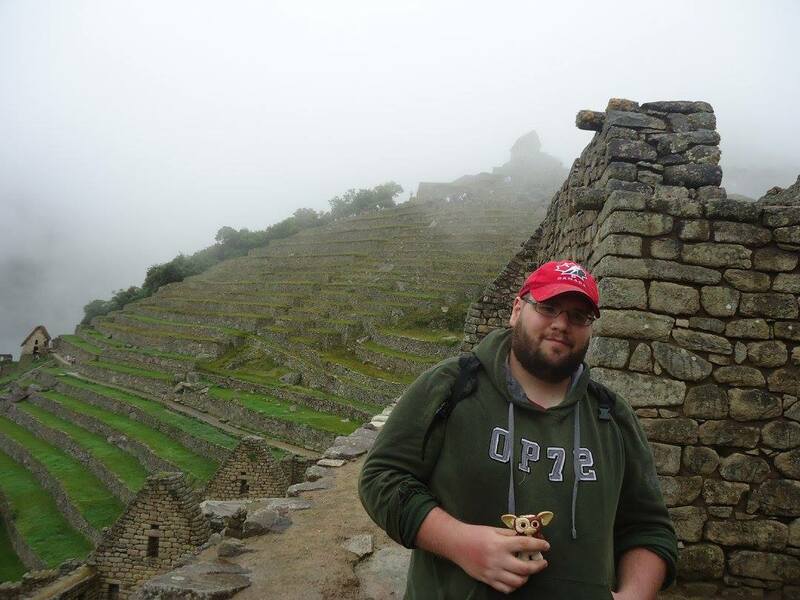 My cousin however has become quite the world traveler visiting places like the Philippines, China, Machu Picchu, and many more with plenty of great story to accompany each trip. In between big trips to these far away lands the traveling bug still hits him and he has the need to go somewhere close. He’s from Canada and coming down to New Jersey tends to be one of his stand by locations. 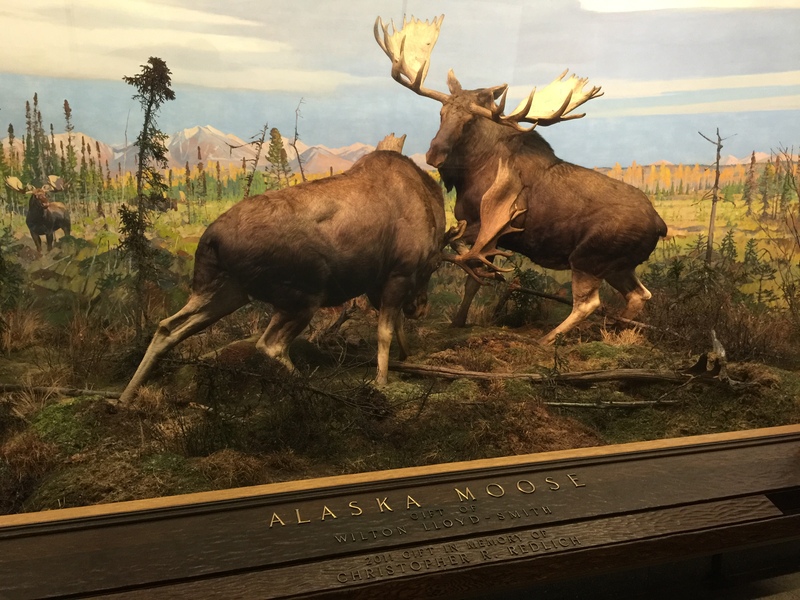 With our proximity to New York, Pennsylvania and even Washington DC it makes for an ideal place to visit a lot of places in a short amount of time. Being Canadian he has an extreme love of Hockey and has a bucket list to visit all the professional arenas. On this most recent trip I was offered a few different venues to see a hockey game with him and decided to check out the New York Islander’s new home arena the Barclay’s Center in Brooklyn, NY. The drop of the puck wasn’t until 7:30 that night so I had a whole day to wander around New York City and try to collect some new pennies. Now where to start? 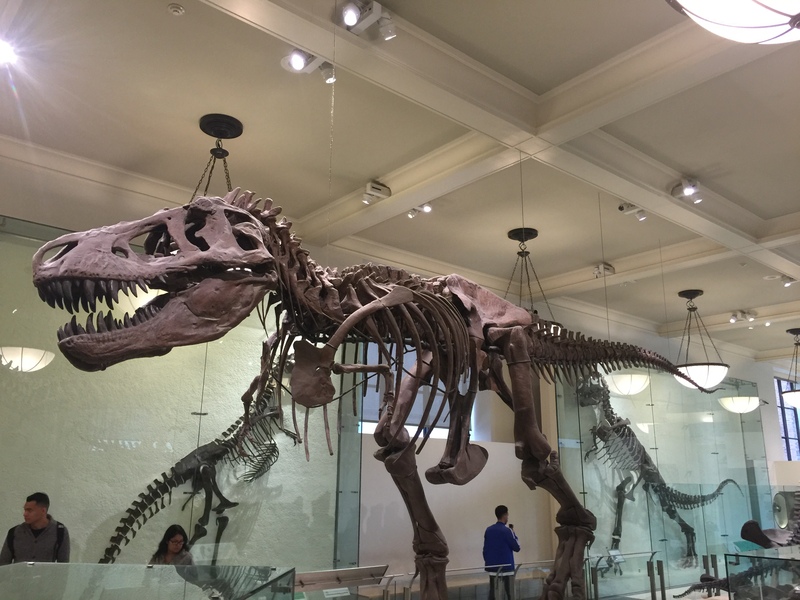 I wanted to make sure I got to visit as many places as I could so my trip began early in the morning with a train ride into Penn Station, then jumped on the Subway for a 10 minutes ride to the American Museum of Natural History. This museum is one of the largest in the world. It was originally established in 1869 and the original building was opened in 1877. The size of this place is truly amazing, and the number of exhibits really makes this a special place to visit. As soon as you walk in through the main entrance you realize how big the museum is. 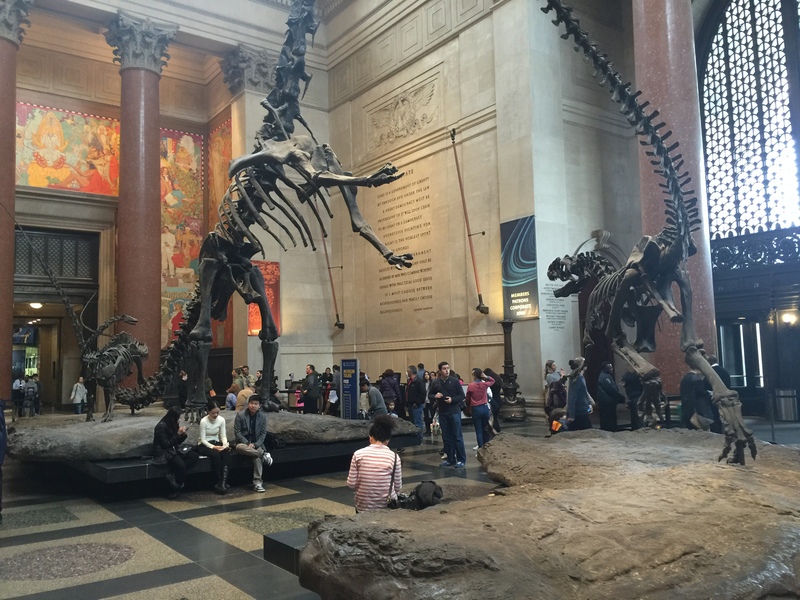 There are two large dinosaur skeletons in the midst of battle looming over you as you buy your admission ticket. 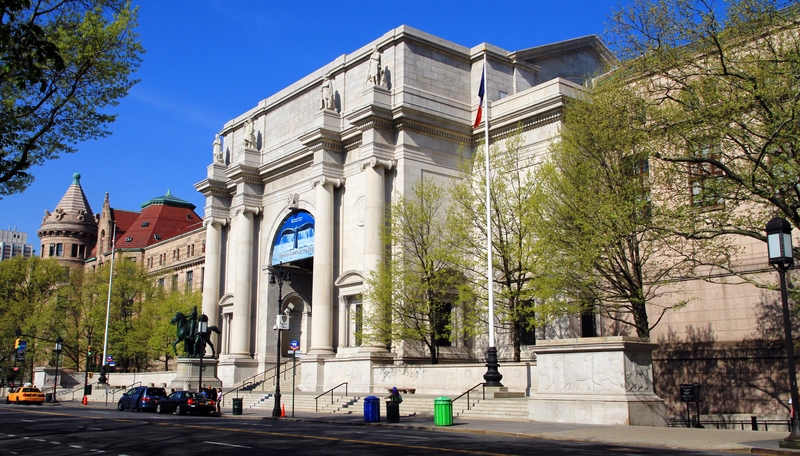 The museum has four floors and includes a planetarium, and IMAX theater. 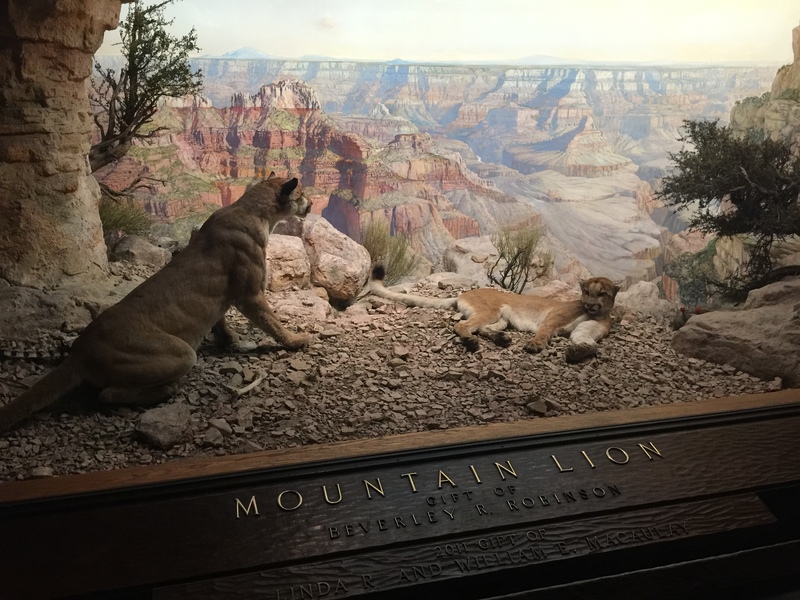 However the animal diorama’s are really something they are known for. 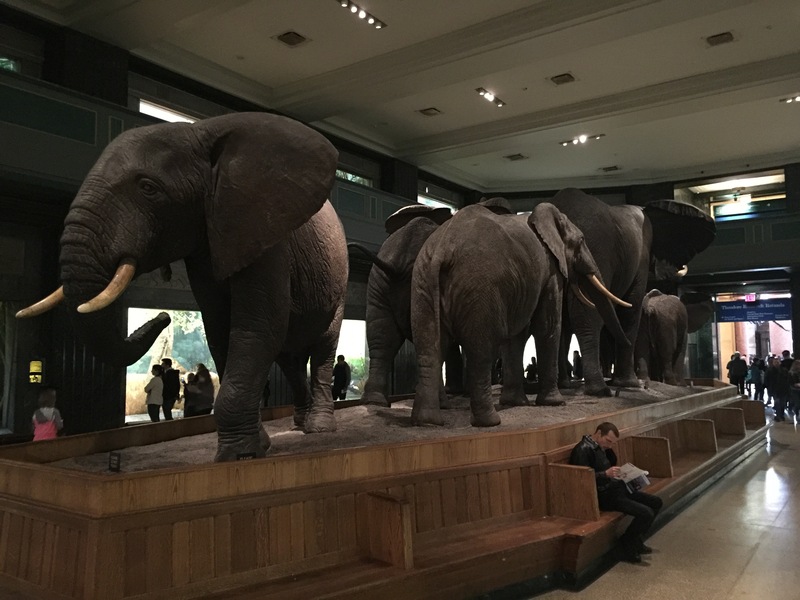 In the Akeley Hall of African Mammals there is a centerpiece that includes 8 African Elephants in a characteristic alarmed formation. Eventually I made my way over to the Hall of Ornithischian Dinosaurs which as I’ve mentioned in the past I just can’t resist. Seeing the size of these animals is still almost too hard to contemplate that they walked the earth millions of years ago. The names are always too complicated for me to pronounce but there is one favorite that I have to locate at each museum. Tyrannosaurus Rex who doesn’t want to see this fierce carnivore, just obviously not in person. Thankfully Jurassic Park hasn’t become a reality just yet. 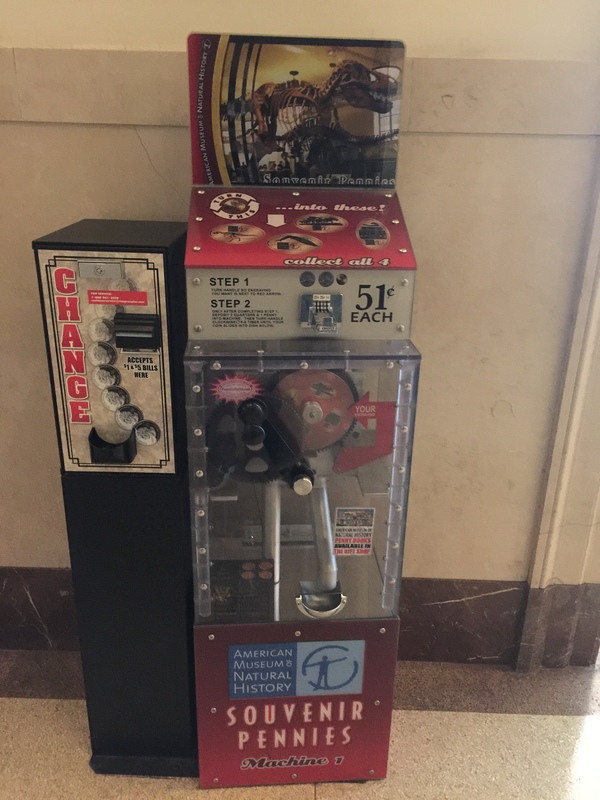 As I made my walk through all the exhibits I did come across each of the four penny machines located here. 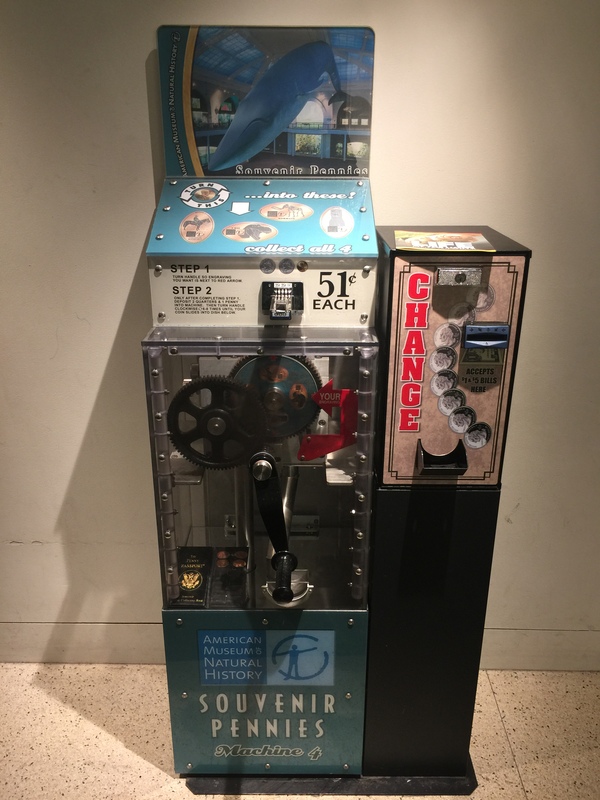 I visited this museum about 7 years ago and three of the machines were the same but the fourth was new. But that didn’t stop me from pressing a brand new set of each coin. 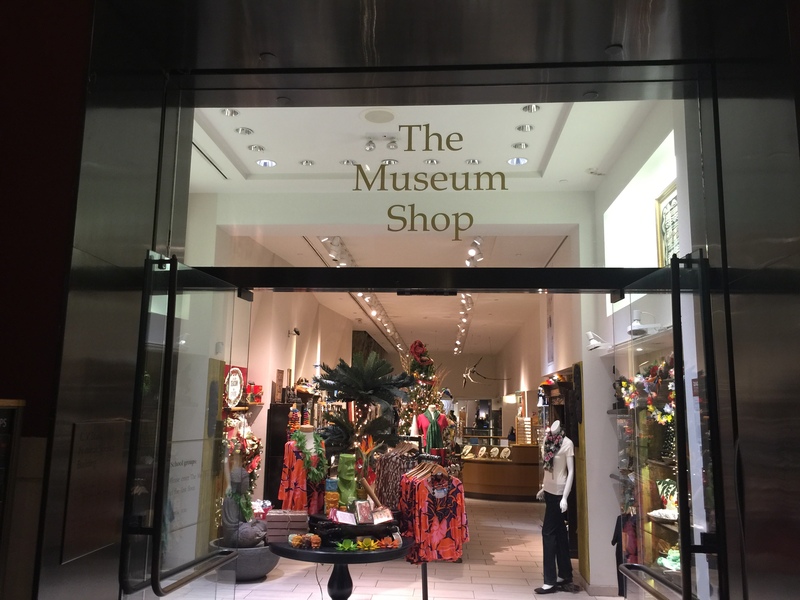 As with most museums they have a gift shop, but the main one located here has a staircase in the middle of it and actually covers multiple floors. On the first floor just outside the gift shop was where I found the first machine. 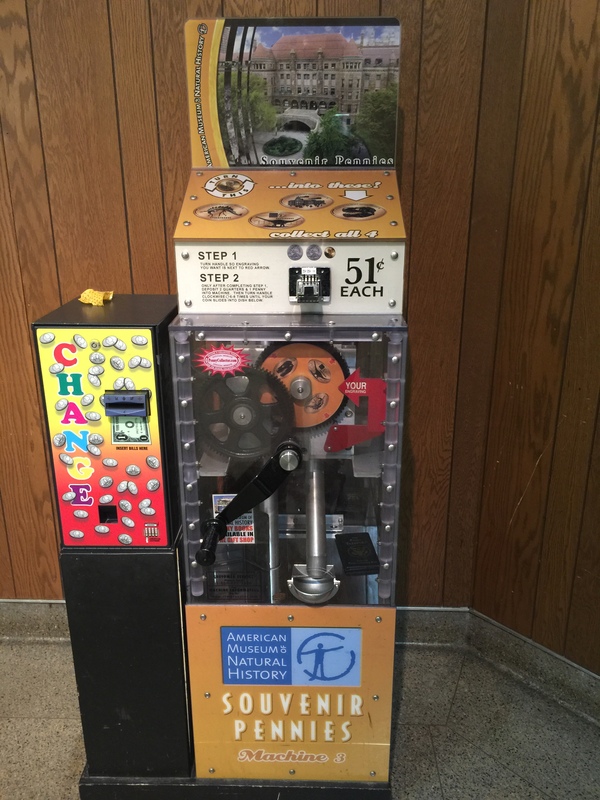 I always come prepared with enough quarters and pennies (plus extra just in case of a short roll) but just in case each of the machines did have a change maker right beside them. 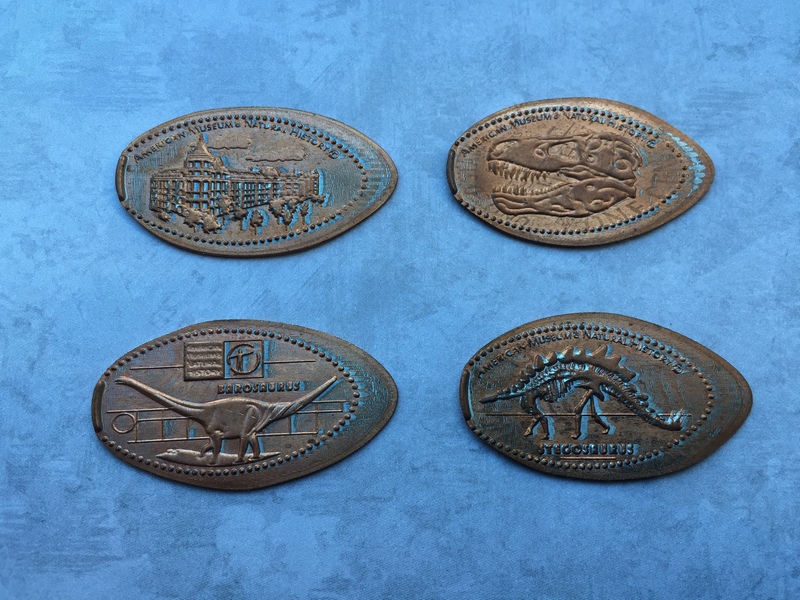 The first machine had four designs: Stegosaurus, Barosaurs, the American Museum of Natural History building, and a T-Rex Skull. I took the stairs in the middle of the gift shop up to the second floor and found the next machine located outside the shop doors. So far all the machines were working perfectly and I had no issues pressing the designs. 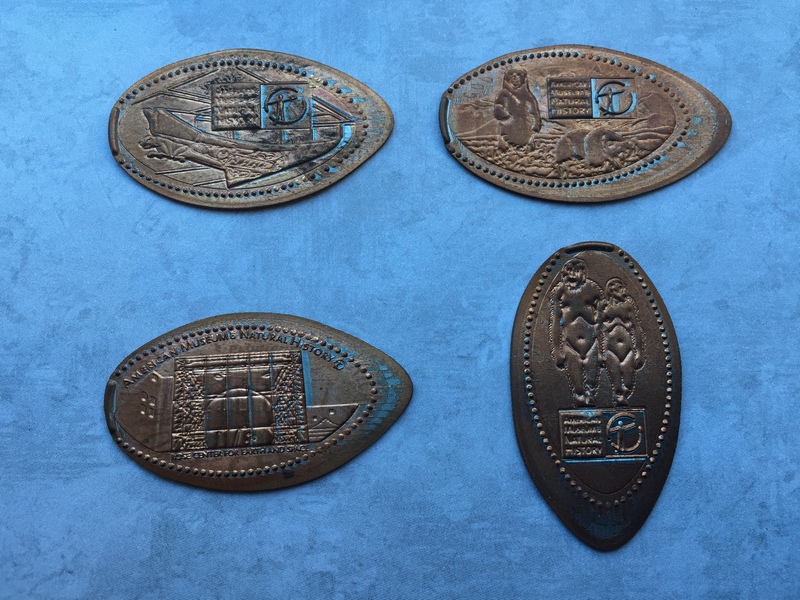 The next set of pennies has images the Alaska Brown Bear Diorama, The Rose Center for Earth and Space, a Haida War Canoe, and the Australopithecus Couple. For the last two machines I had to go all the way up to the fourth floor. 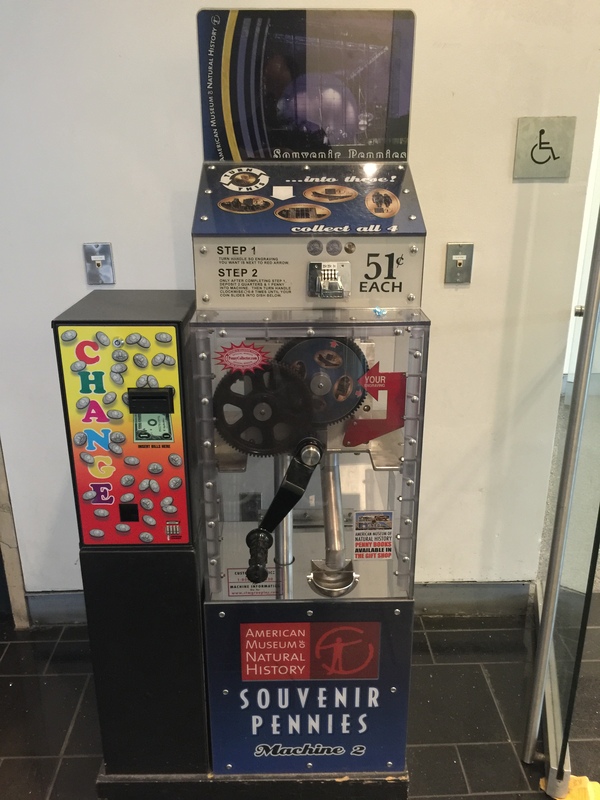 The third machine was right outside the DinoStore. Our of the four machines available in the museum this was the busiest one. Since it was located right near the Dinosaur hall it wasn’t too surprising this has the largest crowd. 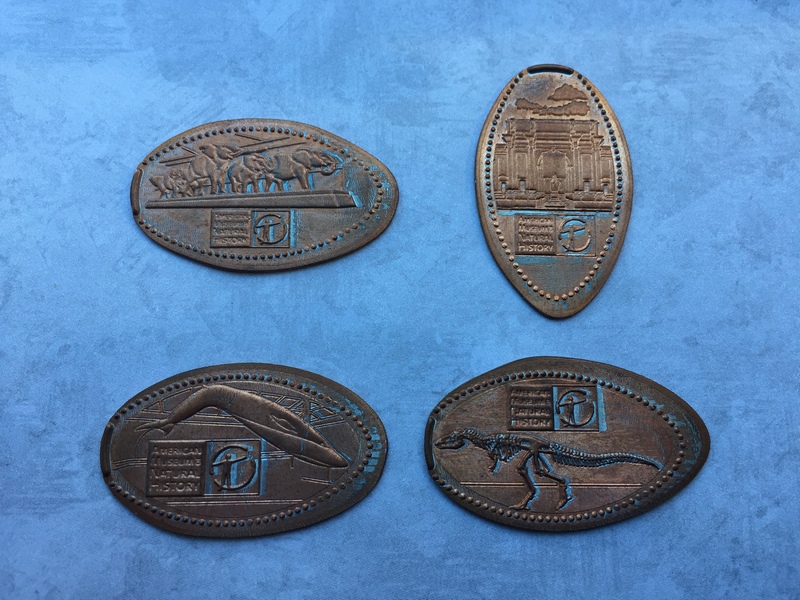 These four pennies were pressed with images of an Allosaurus, the huge Blue Whale, the herd of 8 African Elephants, and the main entrance to the Museum. The last machine was located beyond the Dinosaur hall toward inside the gift shop by the temporary exhibit called Life at the Limits. Just like the other machines this one was in perfect working condition, and was the only new machine since my last visit. 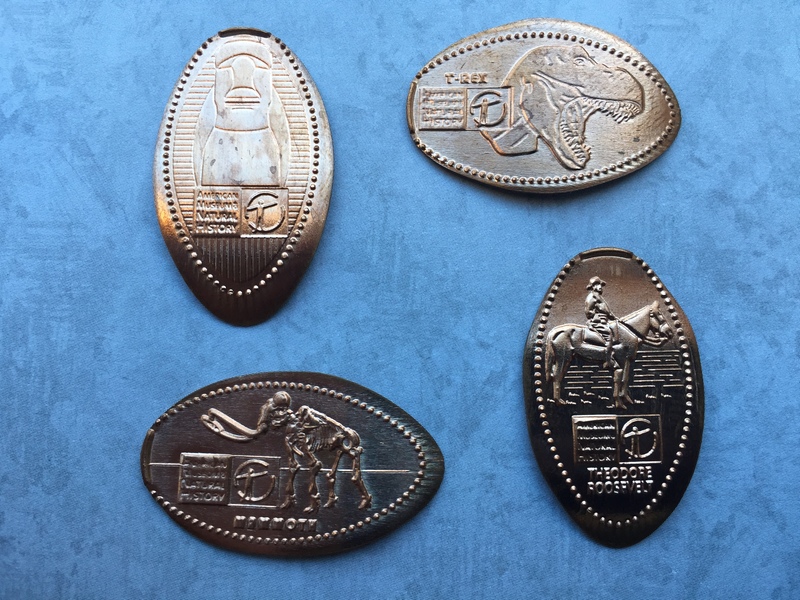 These last four coins had the Easter Island Head, a T-Rex skull, a Mammoth Fossil, and Theodore Roosevelt. With all the coins acquired and safely stored in my jacket pocket I made my way back down to the 1st floor and headed outside into the unusually warm November day. My next stop was directly across Central Park but suddenly I realized I had a huge obstacle in front of me. 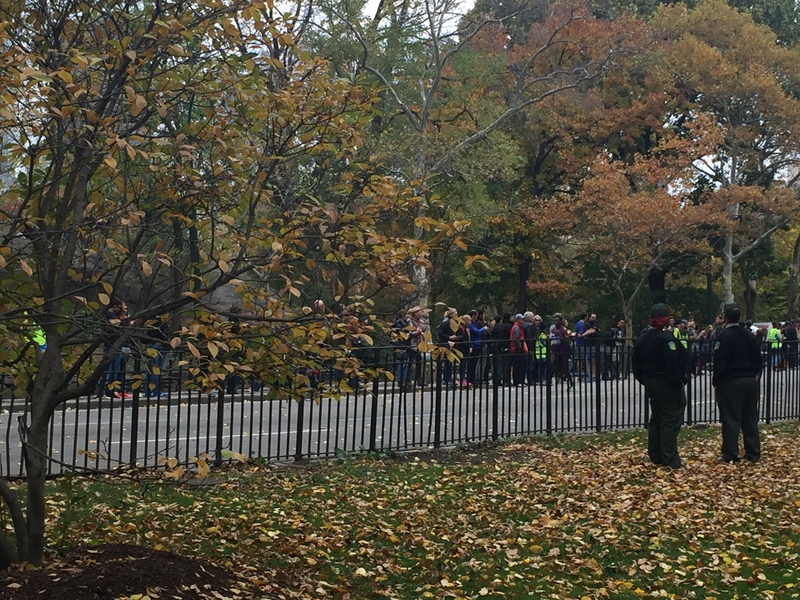 The New York Marathon was going on, and there were road blocks all over the place to keep people off of the Marathon route. It was cool to be in the city and right alongside the runners but I had pennies to press and needed to figure out a way around the course. It took a little longer than I thought it would but I eventually made it to the next stop on my list.